The Nintendo 3DS comes with Terms of Service (TOS) that should not be accepted. In fact, the TOS are so unbelievable that we have included a more detailed summary of them on a separate page. To enforce these TOS, Nintendo uses Digital Restrictions Management. This combination of legal and technological restrictions make the Nintendo 3DS dubious, devious, and defective. […] any existing or future unauthorized technical modification of the hardware or software of your Nintendo 3DS System, or the use of an unauthorized device in connection with your system, will render the system permanently unplayable. Brick Nintendo before they brick you. Help get the point across to Nintendo by sending them a ton of bricks! Our goal is to order 200 bricks for Nintendo by May 18th. to donate to the campaign and we will send a brick — or a whole bundle of bricks — on your behalf along with a letter (below). Please order by Monday, May 18th, so we can send them all at once and have the biggest impact! 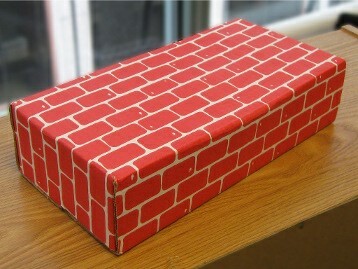 Or, order the bricks yourself, assemble, and then send them to Nintendo along with a custom letter. Share this story on social networks and by email. This is the letter we will be sending along with the bricks. The Terms of Service on the Nintendo 3DS are insulting and I will not accept them. The Digital Restrictions Management technology that you use to enforce these terms allows you to dictate how, when, and even IF, I am able to use the device in my own home. 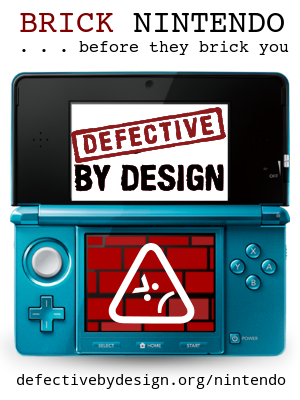 The Nintendo 3DS is Defective by Design and your Terms of Service are dubious, devious, and defective for the following reasons. Dubious: Nintendo tracks all of the activity on the device and all of the data created by a user. Further, the TOS grants Nintendo a license to all "user content" created on the 3DS, which includes "comments, messages, images, photos, movies, information," and more. Note that the 3DS comes with a camera, so you are making a claim on photos or movies that I create! Devious: Whenever the wifi is turned on, the 3DS will constantly try to connect to the Nintendo servers and upload all of the tracked data and information. This is particulary devious when the users are children. And what is your solution to making sure children's personal information doesn't get tracked? You tell parents to make sure their children don't use the device in a way where personal information will be stored. This means kids shouldn't use the camera; they shouldn't create nicknames; they shouldn't chat about themselves; they shouldn't browse the web; and they shouldn't do a host of other things the 3DS was explicitly made to do. If children shouldn't use the device for what it is made for, then why are you marketing it toward children? Defective: You say that at any time, Nintendo can update a device without notice. Further, you state that if you do not like how a person is using the device, then through this update of the system you "will render the system permanently unplayable." Put another way, if you do not like what I am doing with my 3DS, you will brick my device! The attached bundle of bricks is my way of saying that I would rather Brick Nintendo before Nintendo has a chance to brick my device. Drop DRM from the Nintendo 3DS and all future Nintendo products. Change your terms of service. Tracking a user's activity; claiming a copyright license on a user's data and their creative works; and bricking a user's device if she chooses to modify or use it an in "unapproved" way are intrusive and completely unacceptable, to say the least. Make a formal statement apologizing to your customers and responding to these requests.